The Abib Hand Crème Type V is said to have a scent inspired by Vincent van Gogh, starting with a sweet citrus and finishing with musk and sole. It claims to nourish and soothe hands, making them gentle to touch while also firming the skin barrier to help keep them moisturised. The two ingredients represented at the highest concentrations in the Abib Hand Crème Type V that follow water are Glycerin and Petrolatum. The formula relies heavily on these components to moisturise. They complement each other perfectly. Petrolatum is hydrophobic meaning it has water repelling properties and is insoluble in water therefore forms a barrier on the skin. Glycerin on the other hand is hydrophilic. It attracts water by absorbing moisture from the air. Glycerin is a commonly used humectant in skincare. Petrolatum, also known as Petroleum Jelly, is a byproduct of petroleum refining. Vaseline is a classic example of petrolatum. When properly refined to a cosmetic grade it has no known health concerns, otherwise, it can be contaminated with toxic chemicals called Polycyclic Aromatic Hydrocarbons (PAHs), known carcinogens. Different countries have varying regulations on the use of Petrolatum in cosmetics. The EU mandates that for cosmetic use, the full refining history of the ingredient must be declared and proven clean. I could not find any such requirement in the US or Australia however, when used in skincare, it must be cosmetic grade implying a low cancer risk. Similarly, Dimethicone is a silicone based ingredient that prevents water loss by forming a protective hydrating barrier on the skin to repel water. It can fill in fine lines and wrinkles to result in plump looking skin. Like glycerin, Urea is a humectant and hydrophilic substance. It’s naturally occurring, found in the skin surface and an active part (7%, decreasing with age) of our Natural Moisturising Factor (NMF) which functions to keep skin hydrated. Reduced levels of urea lead to a lower water-binding capacity within the skin that can result in skin dryness, roughness or even eczema. Topical applications of urea result in skin softening and can even have an anesthetic effect helping to reduce itching and flare ups. Providing a protective film over the skin are a host of emollients in the formulation including Ethylhexyl Stearate, Ceteraryl Alcohol, Glyceryl Stearate SE; Glyceryl Stearate, PEG-100 Stearate, Palmitic Acid, Isohexadecane. Botanical extracts are added to help reduce wrinkles, fine lines and skin dullness. Moringa Seed Extract has been used historically to enhance lotions and perfumes for centuries. The leaves provide a rich source of protein, vitamin C, β-carotene, calcium and potassium. This in turn delivers antioxidant, antibacterial, antimicrobial and anti-ageing properties. Antioxidant protection is also one of the strengths of Okra, Lupinus Albus Seed and Sweet Almond Extracts. Another age fighting ingredient is Purslane Extract, an annual succulent plant with powerful regenerative properties. As well as being rich in antioxidants, it is a good source of vitamins C and E, β-carotene and contains an impressive amount of barrier strengthening omega fatty acids. Lauric Acid, Oleic Acid and Panthenol (provitamin B5) deliver excellent moisturising properties to the formulation although their concentration is assumed minimal given their late inclusion in the ingredient list. Butylene Glycol is present to increase penetration of active ingredients and there’s also a few humectants to accompany glycerin, some also exhibiting antibacterial behaviour to help preserve the product, namely Pentylene Glycol and Caprylyl Glycol. Rounding off the formula are a handful of emulsifiers, thickeners plus not surprisingly, fragrance. 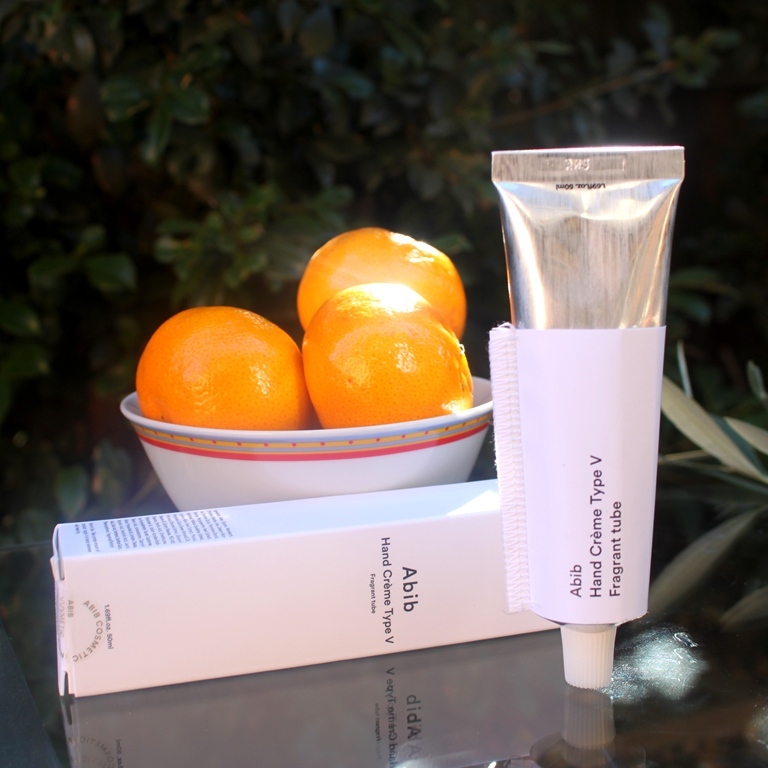 The Abib Hand Crème Type V comes in a tube with screw top lid. Warning flags are raised against the inclusion of fragrance, preservative and Petrolatum in both the CosDNA and EWG assessments. The former are known irritants and sensitizers, the latter as discussed in the science. Apply an appropriate amount on the hands and spread all over. The smell of this particular V model hand cream comprises of strong citrus tones. 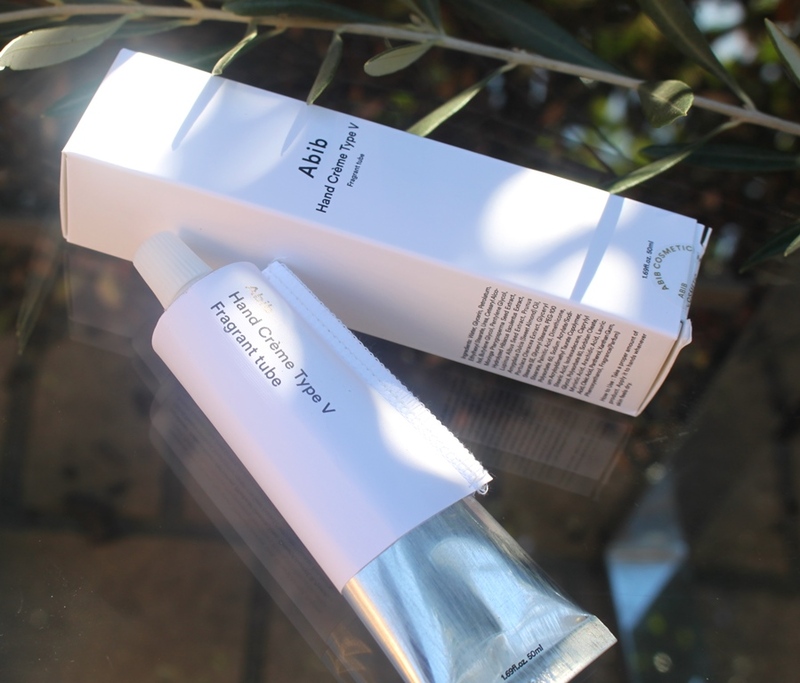 A 50ml tube of the Abib Hand Crème Type V sells for US$18.00 at Style Korean. Abib products are available at Korean skincare boutiques. I received mine from Style Korean. The hand cream expires 12 months after opening. Never ending research is the only way to perfection… Perfection is achieved not when there is nothing more to add, but when there is nothing left to take away. The brand has released four differently scented hand creams, each inspired by the fine arts, in this case, Vincent van Gogh whose paintings often depicted flowers. In terms of presentation, packaging is typical of such a product but spruced up with a metallic finish and a trendy sewn on label. The opening is sealed when new to maintain product freshness and eliminate the possibility of contamination. Reversing the screw top lid into the opening, penetrates the seal making it ready for use. The cream is white in colour and quite dense in consistency. It exhibits excellent spreadability and absorption qualities, taking only a minute or so to fully sink in. Once penetrated, there is absolutely no residue remaining. However, it does leave a strong scent which is to be expected from a self-proclaimed fragrant product. The smell is immediate and strong at first, becoming more subtle after application. It is however extremely lasting and fresh. Furthermore, the scents are not typically feminine or masculine so this definitely exhibits unisex in appeal. I apply this cream every few hours and find that its aroma pleasantly lingers between applications. The brand has nailed the scent description. It claims citrus opening tones with lasting effects of musk and sole which are totally detectable and spot on. (Sole, pronounced solay, is water that has been fully saturated with a natural salt). Although I do find this cream too strongly scented upon initial application, within a few minutes, the aroma dissipates to a more pleasant and tolerable concentration, not unlike a regular perfume. The moisturising strength of this product delivers a double dose of wonderful. My hands feel soft, smooth and supple after using this product a few times a day. I also use this on rough patches such as elbows to experience similar positive results. The combination of glycerin, urea and petrolatum certainly boosts the ability of skin to retain moisture and protect from trans-epidermal water loss (TEWL). It’s difficult to conclude or confirm the benefits of the antioxidants and anti-ageing properties in the cream after only a few weeks, however, the science certainly supports these claims which may become evident after longer term use. If you’ve read any of my posts, you know I am an advocate for fragrance free skincare. However, in this case, I review a scented hand cream so it would be foolish and unfair to criticise this product on this basis. Instead, I praise this hand cream for its achievements in providing a refreshing and pleasant scent that also excels at moisturising the skin, both these benefits having lasting effects. Of course, those sensitive to fragrance should stay clear of this product, otherwise, it is suitable for all other skin types. This product was provided to me free of charge by Style Korean for review. This post only includes my honest opinion and experience of this product and is in no way influenced by Abib, Style Korean, any of its representatives or any other third party.